The government has identified 10 major high-speed rail corridors eligible for stimulus funding. Photo by the White House via About.com. President Barack Obama announced plans [yesterday] to pump $8 billion of stimulus funds into building a network of high-speed and intercity rail. In addition to $8 billion from the American Recovery and Reinvestment Act, the plan calls for at least another $5 billion to fund intercity rail projects over the next five years. 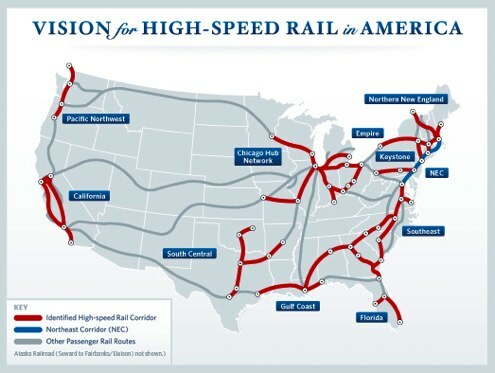 High speed rail is a very welcome addition to the transport choices in the U.S. It increases connectivity and helps reduce green house gases. The plan released by the Federal Railway Administration suggests potential reductions of 6 billion pounds of CO2 equivalents per year. We don’t have full information on the details of this calculation to replicate or contest it in any way. But we can say this: riding inter-city rail between cities produces less carbon dioxide emissions than flying in planes. According to data from Dr. Mikhail Chester from the University of California, Berkeley, trains produce 30% less carbon emissions per mile than midsize aircraft and 70% less than SUVs. Keep in mind, the calculations from Dr. Chester are based on the energy grid of California, which is the best in the country. When we think about railways, we need to be very careful about where the power is coming from. Calculations for California, for example, may not apply for other regions in the country that are more coal-intensive. You not only need trains, but you need a cleaner power grid.